How Far is The Congate Sai Harshan? Sai Harshan offers you with the flawless villas for a composed and peaceful life with your folks. At this dwelling life is redefined with the effortlessly planned arrangement that earnings attention of all the necessities of the contemporary day discrete. Sai Harshan suggestions you a blissful and luxurious life that is eternal. The delay for your impeccable domicile is lastly over with this solicitously premeditated substructure. RCC framed structure with columns and beams, brick paneled walls (exterior walls of 9” thickness and interior walls of 4 ½” thickness) plastered and painted. Main Door: Teak Wood with Godrej/equivalent brand lock, Brass Handle, Magic eye, brass bold, brass hinges and Rubber Door Stopper. Toilets and Service Area Doors: ISI Water Proof Doors/PVC Doors with powder coated handle and tower bolt. THE CONGATE is a partnership firm which was established on 28th August 2006. Since its inception Congate has set the highest standards for itself. We source finest quality products for the benefits of our clients. We possess a team of experts who are sourcing products of international standard to keep abreast with the global markets. The technical know-how coupled with the vast experience of our experts helps in supplying unrivalled products. We have always stuck to timely delivery schedules. The Firm ensures that Safety Standards are maintained in all Projects, Giving the customers a wide range of quality projects. The Congate is one of the most reputed Property Developers in Chennai, who is committed to high performance, professionalism, and quality service. 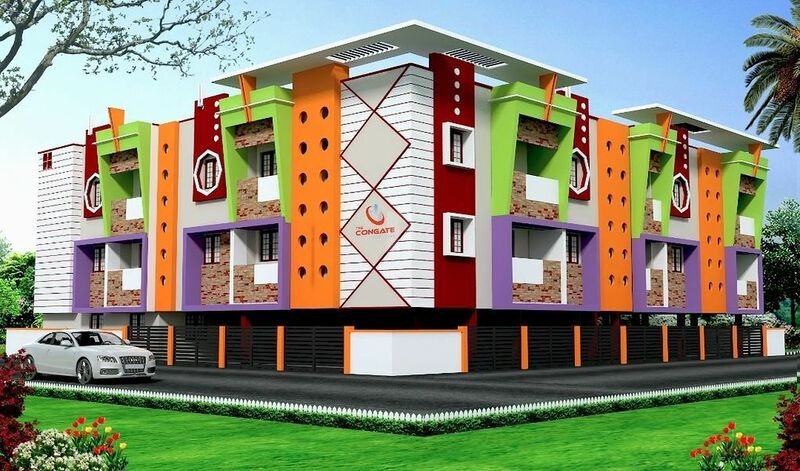 The company had registered a steady growth in its construction activities and spread its wings throughout Chennai City earning a well deserved goodwill and reputation as a reliable promoter with quality construction and client-friendly-approach. The Congate is always proud of the magnificent housing complexes and majestic buildings built by us in the prime locations of the city that acclaim its expertise and credentials in the field of civil construction and promotion. In the near future The Congate expects to step into the construction of malls, complexes, villas etc. THE CONGATE is a partnership firm which was established on 28th August 2006. Since its inception Congate has set the highest standards for itself. Investing with Congate gives a great sense of comfort to the customer. THE CONGATE has completed projects covering about 60,000 Sq.Ft. in a span of six years. The Firm's target is to add another 1,50,000 Sq.Ft. of projects at affordable prices in a short span of time.